Ethan Kaille is a Thieftaker in Boston in the years leading up to the American Revolution. Having suffered losses and reversals in his life, he is neither naive nor without considerable personal resources. He isn’t just a detective; he’s also a conjurer, which makes him someone who lives on the margins of polite society. Some people fear his powers; others merely find him a distasteful rogue who should simply go away… but still, he is useful to the powers-that-be when problems arise requiring his unusual skill-set. This story is one from Kaille’s early days as a thieftaker in Boston. In it, he must face a formidable foe, one of a most unexpected sort, whose own powers, very different from his own, prove the equal of Ethan’s. Both of these stories are decent introductions to Ethan Kaille and Jackson’s urban fantasy take on early-America Boston. 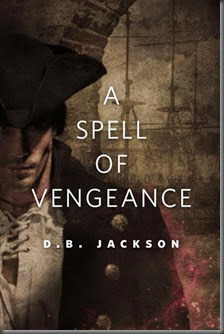 My interest in the novels in the series (now up to three), has grown considerably since reading A Spell of Vengeance and The Price of Doing Business. 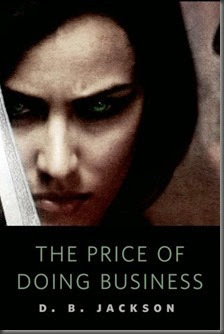 The Price Of Doing Business introduces us to another of Ethan’s frequent antagonists: rival thieftaker Sephira and her worse-than-the-criminals crew. The actually missing-items case is merely a vehicle to allow Jackson to bring these two characters together, in order to establish their dynamics (Ethan is not one to roll over for a more-established, brutal rival). It was certainly an interesting introduction to this contentious… professional relationship. The two stories are over rather fast – this does mean we don’t really have enough time to get a proper sense of Ethan’s place in this Boston. I’m also not entirely sure if we needed the full incantations translated every time he speaks one – every spell includes “ex cruore evocatus”, which the author translates for us each and every time. Felt redundant. Beyond that, Jackson’s prose is well-constructed, and flows quite nicely. He keeps the historical details to a minimum, allowing the reader to fill in gaps. I liked this approach – too often, the story in historical fiction can be swamped by an author’s desire to prove they’ve done their research and include All The Details. Which is maddening, frankly. Overall, then, I enjoyed both of these stories. I think full-length novels will offer the extended narrative and plot that I usually like. I’m looking forward to reading Thieftaker, now. If you’re interested in historical fantasy and urban fantasy, then this series could very well be for you.